Ask a group of people what their favorite movie is and you can be pretty confident that at least one person will say The Shawshank Redemption. It’s just one of those films that makes a huge impact on people and always seems to make “best of” lists. In fact, with more than 650,000 votes it is the top-ranked film of all-time by the readers of the world’s most complete film site, the Internet Movie Database (www.imdb.com). Number one…just beating out The Godfather and The Godfather Part 2. That’s unbelievable. The Shawshank Redemption is not one of my all-time favorite films, but watching it again today made me realize that it certainly is one of the best films of all time. It certainly holds up well and even though I knew exactly what was going to happen at each turn I was thrilled nonetheless. It’s a great film…with a great plot…a great Stephen King inspired story…and great acting across the board. Would you believe it didn’t win a single Academy Award? I know, huh? It lost out to Forrest Gump for Best Picture (also nominated that year were Four Weddings and a Funeral, Pulp Fiction and Quiz Show). Morgan Freeman lost the Best Actor award to Tom Hanks and Tim Robbins wasn’t nominated. 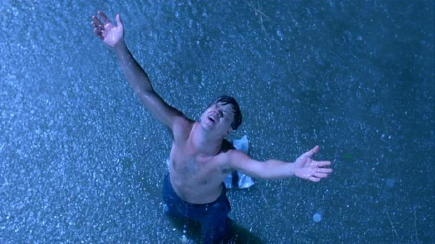 Why do we love The Shawshank Redemption so much? I think there are several reasons. To begin, it’s an underdog story. Andy Dufresne is wrongfully imprisoned for murder and despite huge odds turns the tables on the system. It’s also about good guys and bad guys — in this case the good guys are the imprisoned and the bad guys are the law. We seem to forget (or we don’t care) that Morgan Freeman’s character Red was a convicted killer. Yet we still love him (and of course we love his narration). We all love a good prison movie, especially when there’s an escape. We sure love films when a bunch of misfits (prisoners in this case) put one over on “the man.” We do love Stephen King stories! Truth be told, it’s hard to see why this film is so beloved — it just is. I mean, it’s great…but Godfather great? I suppose the love we have for The Shawshank Redemption will always be a mystery. All I know is it’s a great film that inspires the viewer. That’s good enough for me. Len, you know why it’s great? Because every time you watch it, you can’t wait for the scene where the warden throws the rock through the poster … and then you are hooked until the end when Andy sees Red on the beach – you just can’t stop! It’s like crack! I remember seeing it in the theater and liking it but after watching it 10+ times ever since it just grows and grows on you Plus, Thomas Newman’s score is one of the best of all time! This will always be in my top 10. It’s the payoff. Everything gets resolved so beautifully.